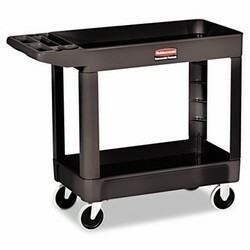 Multiple-duty carts for use in warehouses, mailrooms, conference rooms and maintenance facilities; Heavy-duty plastic won�t rust, dent, chip or peel; Lightweight for easy maneuverability and quiet operation; Rounded corners mean no sharp edges to nick walls or furniture Structural foam construction, 500-lb. capacity. Two tray-style shelves, cup holder and storage slot to stay organized. 5" molded-in ergonomic full round handle for comfort. Nonmarking casters (two swivel). 33-1/4" high. Assembly required.